Chrysler's first factory-installed four-speed transmission (1963) was the Borg Warner T-10. It didn't take long for the engineers at Chrysler to conclude a stronger and more durable transmission was needed, and the New Process A-833 was introduced with the 1964 model year. Both '64 and '65 models carried the flanged output for the ball-and-trunnion style universal joint. B- and C-bodies utilized the common 2.66 low gear ratio, while the A-body transmissions were 3.09 low gear ratio. 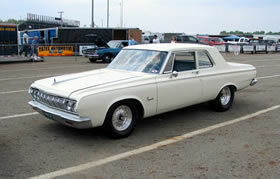 The 1965 Super Stock 426 Hemi-powered vehicles received the first heavy duty "Hemi" 18-spline input models. The flange-style output was dropped for the 1966 models, and the slip-yoke tailshaft was introduced. The long tailshaft versions utilized the larger 30-spline output shaft (same as the 727 Torqueflite) and the short tailshaft version the 26-spline output shaft (same as the 904 Torqueflite). The production of the 1967 383 big block-powered Darts and Barracudas mandated the addition of the 30-spline output shaft in the A-body transmission, which was expanded to include all A-body transmissions in 1968. Beginning with the '68 models, a small (3" X 7/8") raised machined pad was added to the main case, just above the casting numbers on the passenger's side. The car's serial number, along with the transmission's build date (10,000 day calendar code) and a 4-digit sequential production number are stamped into this pad. With the beginning of the 1970 model year, the new "lug-style" synchronizer rings and the wider (.382" vs .216") synchronizer strut keys were introduced. Production of the AAR Cuda and T/A Challenger Trans-Am models in the spring of 1970 introduced the 2.47 low gear "close ratio" 23 spline gearset. 1970 A833 production brought to an end the tried and true ball-detent side cover, switching to the interlock lever design for 1971. The 18-spline transmissions also received a gear change with a 2.44 low gear ratio gearset for the 1971 models. 1974 ended the long tailshaft B- and E-body 4-speed production, while 1975 was the last year for the A-body short tailshaft 4-speed and the beginning of the overdrive versions of the A833. The 23 year run of the famous A833 ended with the 1986 model Dodge trucks.